A speeding ticket in Illinois is expensive, but the car insurance quote increases that drivers face after getting caught speeding often have an even greater impact on their pocketbooks than the ticket itself. In Illinois, driving 15 miles per hour over the speed limit will result in a $120 fine. After receiving a speeding ticket, the average Illinois driver will face a $124.80 increase in his annual car insurance rate. Insurance hikes last for five years in Illinois, so drivers can expect to pay $624 more for insurance if they’ve been caught speeding. The true cost of a speeding ticket in Illinois is 6.2 times the cost of the actual ticket—drivers pay an average of $744 in total for a $120 speeding ticket. Not all drivers in Illinois, however, experience the same insurance increases. For example, a driver in Harvey will pay $171.57 more per year for car insurance after getting a ticket, whereas a driver in Evanston will only pay $91.48 more per year. Generally, the percentage increase in car insurance rates is consistent in Illinois—about 12%. The disparity in dollar amount increases can be best explained by the variability in car insurance rates from place to place. The average car insurance increase for Illinois drivers after a 15 miles per hour over the limit speeding ticket is $124.80 per year. Insurance increases often last for five years in Illinois, which means a $120 ticket actually costs $744. In Illinois, the average driver will face a 12.34% annual insurance premium increase after receiving a speeding ticket. Nine out of the 10 cities that see the largest insurance increases after speeding tickets are in Cook County. Chicagoans, however, do not crack the top 10; they have the 15th largest insurance increases after getting a speeding ticket. What should you do if you receive a speeding ticket in Illinois? Plead guilty, pay the fine and receive a conviction. Plead guilty, pay the fine and attend traffic safety school to avoid receiving a conviction. Plead not guilty and request a court date. If you are eligible to attend a traffic safety course: It is often more financially responsible to take the course and avoid a conviction. For example, drivers in Cook County only have to pay $27 on top of their ticket to enroll in traffic safety school. Although you will pay slightly more, your insurance rates will stay the same. If you receive a conviction: Now is a good time to gather new quotes from a few auto insurers. Some carriers will overlook traffic violations, but drivers won’t know if their carrier is one of them unless they do their research. Chicagoland drivers see the greatest insurance increases after getting a speeding ticket, especially those in the south suburbs. Compared to other Illinois drivers, the average Harvey driver pays the most for car insurance, $1,340.81 per year. As a result, they have the highest per year increase of any Illinois city, $171.57, even though the percentage increase is on par with the state average. The average Harvey household earned $28,123, much less than the state average of $56,853. Education levels often affect an area’s car insurance rates. Only 10.5% of Harvey residents have a bachelor’s degree or higher, compared to 31.1% of Illinois residents. According to the U.S. Bureau of Labor Statistics, Harvey also has a 12.5% unemployment rate—higher than the state average of 7.9%. After getting a speeding ticket, Cicero drivers pay an average of $163.81 per year more every year for car insurance. Since speeding tickets normally affect car insurance premiums for five years, Illinois drivers who receive speeding tickets pay an extra $819.05. Drivers in congested cities often have higher car insurance premiums. With more cars and obstacles on the road, drivers face a higher likelihood of getting in an accident. Cicero has a higher population density than Chicago, with 14,303.7 people per square mile. Park Ridge is one of two northern suburbs to make the list of cities with the largest insurance increases after a speeding ticket. The average Park Ridge driver pays $1,147 per year for car insurance, but after receiving a speeding ticket, that number jumps to $1,309.13. Since hikes normally last for five years, Park Ridge residents can expect to pay $810.65 more for insurance as a result of a minor speeding ticket. Berwyn drivers, like neighboring Cicero drivers, have high car insurance rates. A typical Berwyn driver pays $1,211.88 per year for car insurance. However, after receiving a speeding ticket, the average driver must pay $162.00 more per year for car insurance for five years. 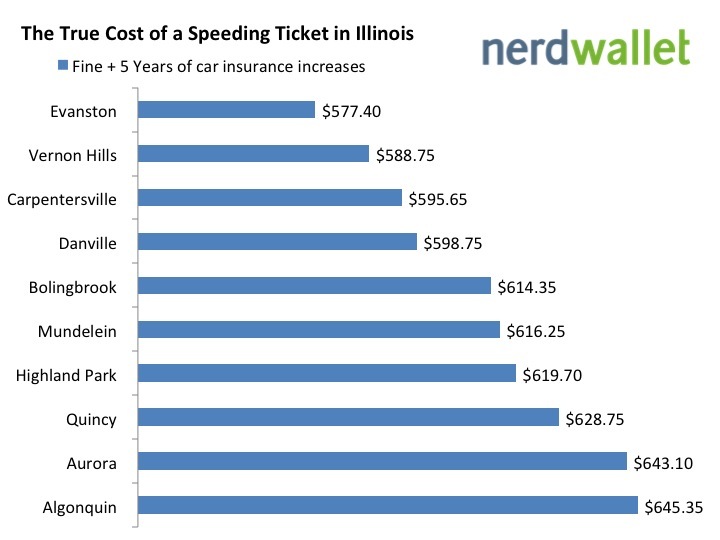 As a result of a single speeding ticket, the average Berwyn driver pays $810 more for car insurance. A municipality’s density is a large factor when determining car insurance rates. Berwyn has 14,508.8 people per square mile, which is the highest population density of any township in Illinois—even more than Chicago. Calumet City drivers see the fifth highest insurance increases after they receive speeding tickets. On average, Calumet City drivers pay $1,275.44 per year for car insurance, but after receiving a speeding ticket, they can expect to pay $1,437.13 each year. The average car insurance increase is $161.69 per year in Calumet City, which results in a five-year total of $808.45 extra in car insurance costs. Oak Lawn drivers are virtually tied with Calumet drivers when it comes to the dollar increase in insurance premiums. 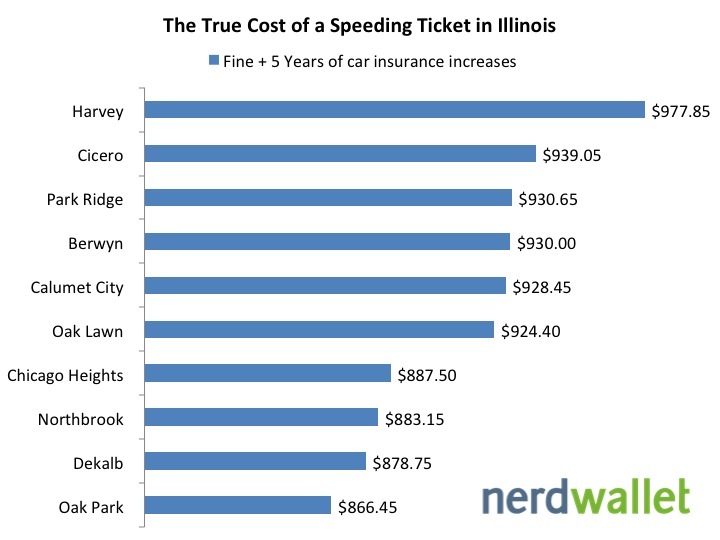 After receiving a speeding ticket, Oak Lawn drivers pay $160.88 more per year on average for insurance. Since premium increases normally last for five years, this results in a grand total of $804.40 in insurance increases. Drivers in Chicago Heights, one of Chicagoland’s south suburbs, face the seventh largest car insurance premium increases after they receive a speeding ticket. Once convicted of a speeding ticket, the average Chicago Heights driver will see his car insurance premium increase by $153.50 per year for five years. Drivers will thus pay $767.50 more for insurance as a result of a single speeding ticket. Northbrook is the northernmost suburb to make the list. On average, its residents pay $1,034.50 per year for car insurance. After a speeding ticket, Northbrook drivers pay $152.63 more per year. In total, they will pay $763.15 in insurance increases after a speeding ticket. Dekalb, a city in Dekalb County, is the only city to make the list that is not in Cook County. The average Dekalb driver pays $891.63 per year for car insurance, but after receiving a speeding ticket, Dekalb drivers will pay $151.75 more per year for insurance. Factor in a five-year insurance increase, and a Dekalb driver will pay $758.75 in increased insurance premiums for a single ticket. Oak Park is often admired for its combination of suburban charm and its easy access to big city amenities. It borders Chicago and has connecting “L” lines. Oak Park drivers, however, pay slightly more for insurance than their big city neighbors after getting a speeding ticket. After receiving a speeding ticket, Oak Park motorists will pay $149.29 more per year for car insurance. Accounting for five years of insurance increases, a single speeding ticket will cost the average Oak Park driver $746.45. 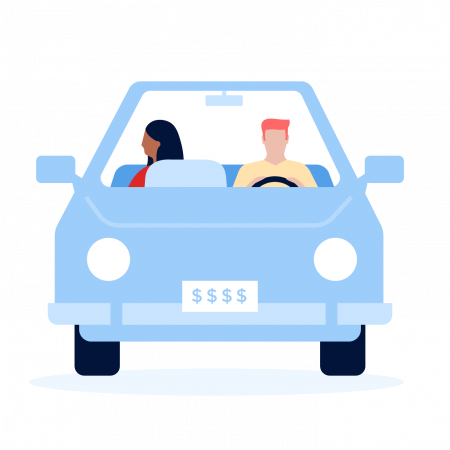 To determine the average insurance premium increases, we retrieved quotes for four different driver profiles in Illinois: 27-year-old single men and women and 40-year-old married men and women each driving Toyota Camrys and Ford Escapes. For each driver profile, we chose each city’s two cheapest car insurance quotes to mimic consumer behavior and to determine our overall average. We only surveyed cities that had populations greater than 15,000 residents. All demographic data comes from the Census. We calculated the total cost of the speeding ticket by adding the cost of a speeding ticket to five years of car insurance increases. The estimated costs are for illustrative purposes only. The actual insurance increases you face will vary depending on your insurance carrier, your location and other factors. 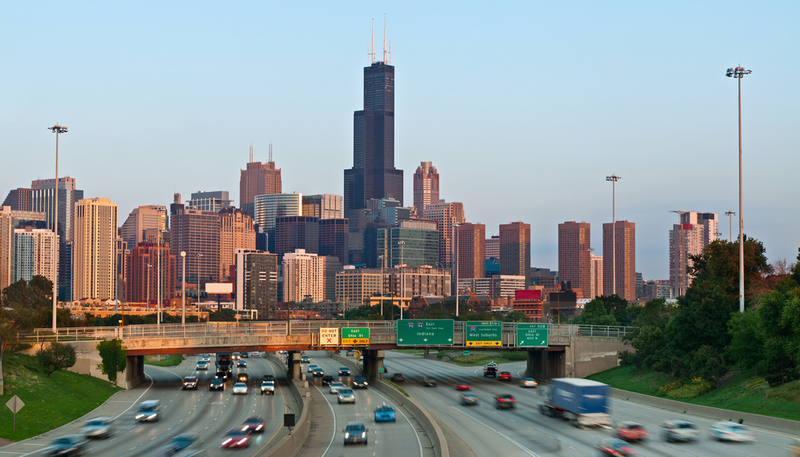 Chicago freeway image via Shutterstock.